An FO! I finally did it! 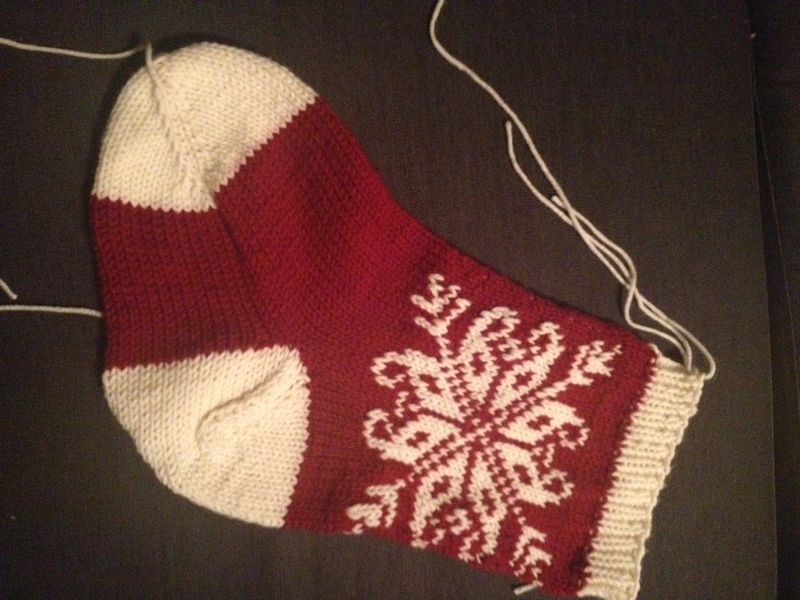 I finish a stocking. Now, only a handful more to go and we’re good. Well, sort of. So, what’s the verdict? I’m on the fence on this design. It was completely improv, little to no planning involved. In that respect, I’m quite happy with it. So what’s the deal? In my opinion, this is an oddly proportioned stocking. The toe part looks huge compared to the leg part, even though both are the same number of stitches around and not far off in height. I think it’s the huge white toe that makes it look this way. Mom liked the stocking, though, and that’s the important part. I do like how the colorwork turned out, even if it is a bit scrunched in places. I didn’t do so well with my tension this time around. I’ll have to keep an eye on that for the other stockings. Also, I did not use the wire guide I bought from KnitPicks. It messed up my tension even more, probably from lack of practice. I did very little knitting over the weekend once the heel was complete. I tried Saturday morning to get into the knitting spirit and start a swatch or something for more Christmas presents. I’ve got an awful lot of hats to get done, so I really need to kick it in gear. In the end, I didn’t start any hats. I ended up dragging out some leftover sock yarn, some fuzzy filling, and needles and started to work on hexipuffs. I hadn’t worked on any for months, so I was a bit out of practice and had to go review the pattern and tutorials. Once I got going, well, I was still really slow. I think I managed to do 3 or 4. Now I just have to keep them away from the kitten. She’s stolen all my other hexipuffs. My husband thinks she likes them because she can carry them around the house, and when you throw them, she can slide along the wood floor on it. She seems to really love them. I have half a mind to just let her keep the ones she’s claimed and just work on making new ones. I can just picture the kitten with the hexipuffs 🙂 I had a productive weekend of knitting – I completed a dog sweater and started a hat! I love dog sweaters! I’ll bet it’s adorable!